Last year we reviewed Planet 316 and WorthyKids/Ideals Daily Bible Jigsaw app and we loved it! You can read that review here: Daily Bible Jigsaw. This year we were asked to review the Planet 316 Story Bible and the companion Planet 316 Story Bible App. They are amazing! I chose this review because I thought it was something that Jack and Laycie would love. We love reading Bible stories together and I’m always looking for new books that share God’s love with them. The cover of the Planet 316 Story Bible is adorable. The cover features different Bible characters from the stories shared throughout this beautifully designed Bible for children. The back of the Bible shows you how to bring the Bible to life with images that explain how to use the app along with the Bible. The Planet 316 Story Bible begins with a dedication page like most Bibles. It contains more than 100 beautifully designed Bible stories inside it’s semi-glossy pages. In the front, you will find a note to parents and another page sharing about the companion Planet 316 Story Bible App. There is a full Table of Contents so you can easily locate any Bible story favorite you and your child may have. Then begins the Old Testament with a brightly colored image sharing several stories from this section of the Bible. Creation, Noah’s Ark, the story of Moses are all included in the Old Testament. The imagery is gorgeous and the characters are adorable. This Bible is designed for you children to truly enjoy. The New Testament follows with the story of Jesus’ Birth, the miracles he performed, and his Resurrection. All the favorite stories you could wish to share with your little ones. In the back of the Bible, there is a People, Places, and Things in the Bible reference for you and your child that is helpful to find things you may be looking for within the stories. This is a great asset for when you can’t recall the name of the story but know what it contains. The companion Planet 316 Story Bible App is available for Apple products and for Google as well. It opens to an instructions page that shows you how to use the app. It’s really quite simple to use. You turn on the app, scan the image from the Bible with your device and the pages just come to life. Each page pops up with a 3D image from the page that shows action and movement as you view it. This augmented reality makes reading the Bible fun and exciting for children. We really LOVE our Planet 316 Story Bible and have already recommended it to many others. The stories are fun to read. Jack loves reading this Bible nightly now. The Planet 316 Story Bible from Planet 316 and WorthyKids/Ideals is available for $18.99 US. 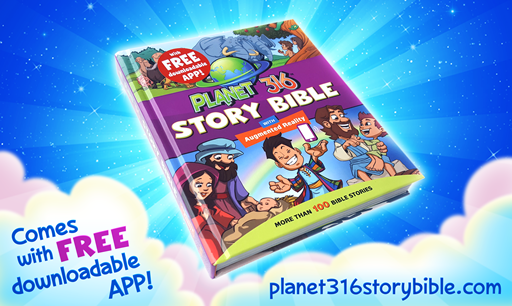 The Planet 316 Story Bible App is a free download that works along with the Planet 316 Story Bible. This would make a great addition to any children’s library. Here is something I bet many of you did not know about Homeschoolers: You can graduate and you can issue a full diploma to your student. Homeschool Diploma can help you make this happen. They provide you with everything you need for your Homeschool Grad. They offer a full package with Cap, Gown, Tassel and Personalized Diploma. We were also able to receive a copy of the standard diploma, a Laminated Wallet Diploma, and a Pre-Stamped Diploma Cover as well. It is hard for me to believe that we are at the point of Graduation already but my 17 year old is almost grown. It’s hard on a Momma’s heart to see the years pass so quickly by. As homeschoolers, we don’t do things like Public Schoolers most days but I did want him to have something to commemorate this experience as well as a real diploma to show he did his schooling through the years. This child has been such a joy to raise and love. I want nothing but the best for him and that included for his Cap, Gown, Tassel and Diploma. Homeschool Diploma was more than we could ever have wished for. You order online with ease through their professionally designed website. The process is very easy. There are so many choices to make as you decide what you want for your Cap, Gown, Tassel and Personalized Diploma package. First, let’s talk about the Personalized Diploma. I was able to choose between a smaller, standard sized diploma and the larger size. In the beginning, I chose the smaller size but after designing I asked to switch to the larger format. This was easily done, even after submitting, by emailing the company right away. They were happy to change it for us. They also offer a Standard Diploma that does not come with all these bells and whistles but is just as nice as the Personalized Diploma. There are so many options to choose from for your diploma. First, you’ll need to choose a School Name to represent your Homeschool. Some states require a school name while others do not. Our state does not so we decided to create a new one. It took a few days but our family finally decided upon Ocean Mountain Academy. We chose this because my children have been educated from the Ocean to the Mountains during our time homeschooling. For us, it means a lot. There are many elements to the process of creating the diploma. You can choose to make a standard school diploma that looks much like a Public School diploma. You can choose to develop a diploma that contains many elements that point towards your child having been homeschooled in the phrasing. For us, I chose to create a Christian based diploma that represents our style of education, as well as our hopes for the future. It is followed with the date we have chosen for his graduation which has not happened yet. Additionally, I was able to choose a Bible verse or a quote to add to our diploma. I was able to choose between having two names listed as the signature line like a Public School diploma or to list one name and the date. There were several options for this. I chose to list Instructor on the left and the Date on the right since I have been the main educator throughout my children’s lives. In between these, I was able to choose a seal. There were also several options for this from embossing, a foil seal and a colorful foiled seal. Different seals were available and I chose the one I felt represented us best. I chose a gold and blue seal with a cross and crown in the middle that states Soli Deo Gloria: To God Alone Be The Glory. You can also choose an Honors foil seal. I love my son’s diploma and can hardly wait to create my daughters because this process was simple and fun. Additionally, I was able to order a second diploma in case something happens to the original, as well as a Laminated Wallet Diploma. The second diploma is formatted exactly as the first. Our Personalized Diploma also came with a Pre-Stamped Diploma Cover. I was a little disappointed that the cover was limited on color options but I’m happy with it in the end. I choose a solid black cover for my son’s diploma. The Diploma cover also come with multiple options to choose from. I choose to place a replica of the seal on the diploma on the cover. This replica is simply gold embossing that fits the style of the rest of the embossing on the cover. I also had our School Name, Ocean Mountain Academy added to the cover and my son’s full name is written at the bottom right corner. I love how beautifully this turned out. It truly stands out and is beautiful. The next step in the diploma process was choosing our Cap, Gown and Tassel. I knew immediately, if it was available, we wanted purple. Purple is my son’s favorite color, it’s my daughter’s favorite color and it’s the color for Epilepsy. Purple means a great deal to our family. I’m thankful that Purple was indeed one of the color options. I chose a length I felt would work for my son and hit submit. The selection process for this was just as easy as the rest. The Tassel also had many options available. We could choose various colors, or even two colors. I asked the kids what they wanted for their graduation tassel and together they chose purple only. We were also able to chose between a silver and a gold 2018 charm. They chose silver. There are so many options available at Homeschool Diploma. You can order a class ring. You can order additional graduation jewelry. You can order mugs, shirts, picture frames. Almost anything that you can order for a public school homeschooler, you will find on Homeschool Diploma’s website. Honors accessories are also available to be purchased. Homeschool Diploma also offers Kindgarten Cap, Gown, Tassel and Diploma sets, as well as an 8th Grade Diploma option. 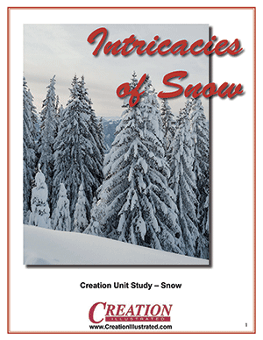 Creation Illustrated asked us to review two Unit Studies this year: Snow Unit Study and Pine Trees. They also have new Digital Editions of their magazine that these go with for expanding learning. They are the Fall ’17 Digital Edition and the Winter ’18 Digital Edition. They were a lot of fun to work through. 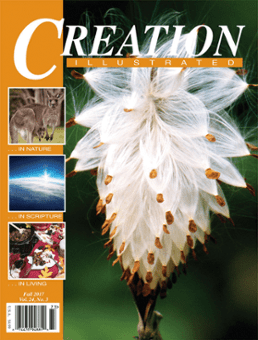 We were introduced to Creation Illustrated a few years ago through the Homeschool Review Crew when we reviewed physical editions of their magazine. These editions were beautifully designed and full of wonderful, educational information. Their digital editions are just as wonderful as their print editions are. And best of all, they are Creation based so they show nature through a Christian perspective. For purposes of this review, we were given access to the Creation Illustrated Fall ’17 Digital Edition and the Creation Illustrated Winter ’18 Digital Edition along with the unit studies that go along with these editions. 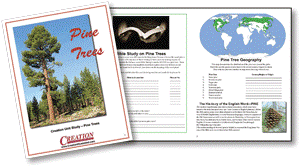 The Creation Illustrated Fall ’17 Digital Edition goes along with the Pine Trees unit study. Information for the study begins on page 8-9 of the Fall ’17 Digital Edition. The study is designed for grades 5-8. The study begins by sharing information on reading and educational resources to use with the study. Next you’ll find a selection of links to Educational Videos that can also be used along with the study. Next, you learn a bit about the history of the word “Pine” followed by a list of related vocabulary words and spelling words. 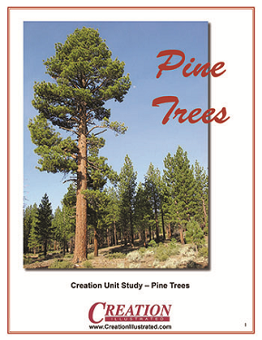 The study includes a Bible study on Pine Trees as well. I found this very interesting. Did you know that Fir trees do not grow in Palestine? I didn’t before this study! This study includes Geography, Science, and even Math. It has a little of everything so you get a full learning experience. The study ends with a word search on Pines. This study is designed to be easy to use. It is easy to get started and work through. You could use it with a younger child if you’re guiding them or with an older child as a review. We used it all together. 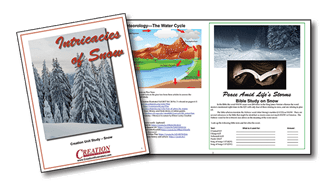 The Snow Unit Study goes along with the Creation Illustrated Winter ’18 Digital Edition. You will find the information related to this study beginning on pages 20-21. The images are outstanding. The Snow Unit Study follows the same design as the Pine Trees unit study. It begins with related information and videos, followed with important vocabulary and spelling. I like that these start out with the important words to know so it makes it easy to cover these before you work through the full study if you wish to. This study also covers relation to the Bible. Did you know that the word “Snow” appears 24 times in the Bible? I sure did not! Both of these unit studies end with the answer keys so you can find the answers easily as well. The BEST part of these Unit Studies is that they are so CHEAP. They are both priced at $9.95 each but they are currently available for $6.95 each. That’s a 30% discount! 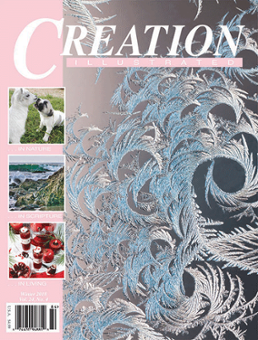 Creation Illustrated offers both Digital Editions and Print Editions for purchase. You can also subscribe for future magazines to be delivered right to your door. These magazines are beautiful and will bring you much joy.